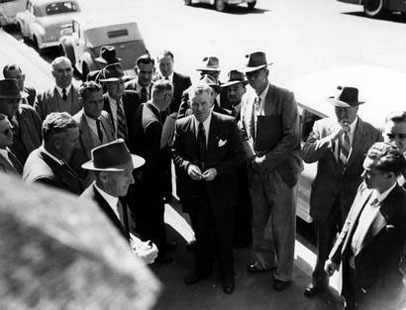 The anti-communist Victorian State ALP Executive, locked out of the ALP Federal Conference in Hobart, 1955. Image courtesy of the National Library of Australia. The greatest domestic outcome of the Petrov Affair was the Labor Party Split, which had immediate and long lasting consequences for the Labor Party and the Australian political landscape. — Professor Manne on the consequences of the Petrov Affair. Old Parliament House collection. Evatt’s position on the Petrov Affair inflamed existing divisions within the Labor Party. The anti-Communist Right of the Party bitterly opposed the conspiracy theory that Evatt mounted at the Petrov Royal Commission. They believed his conspiracy theory amounted to a defence of Communism. B A Santamaria, leader of the Catholic group called The Movement. After a series of dramatic meetings, involving fist-fights and wild accusations, disagreement became violent dissent within the caucus. On October 6 1954 Evatt charged the Catholic group, The Movement, led by B A Santamaria, with being part of the conspiracy against him. Evatt believed The Movement was directing a small group within the ALP to subvert the Party. As a result of Evatt’s charge the ALP Federal Executive called for a review of Labor’s Victorian branch. The branch came out fighting, claiming they were being made scapegoats for Evatt’s failure to win support before the Royal Commission. Following its inquiry into the Victorian branch, the ALP Federal Executive dismissed the Victorian State Executive and appointed a new one. Both the old and the new Executives sent delegations to the ALP conference in Hobart in March 1955 but only the new Executive was admitted. The old Executive was locked out of the Conference. In the political turmoil resulting from this exclusion a breakaway group called the Australian Labor Party (Anti-Communist) was formed, later to become the Democratic Labor Party (DLP). This new Party took a significant portion of the ALP vote and passed its voting preferences to the Coalition. Menzies announced an early election for December 10 1955. By then the Petrov Affair had become a serious political liability for Labor—much more so than in 1954. Not once during the 1955 election campaign did Evatt mention the name of Petrov. Despite Petrov’s defection the 1954 election had been close run. But the 1955 election was a landslide victory to the Coalition. The Menzies Government won 75 seats in the House of Representatives against Labor’s 47. The Split played a decisive role. Taken together, votes for Labor and anti-Communist Labor would have been similar to 1954, so the preferences that anti-Communist Labor gave to the Coalition proved critical. Menzies remained Prime Minister for the next 11 years and the Coalition stayed in Government until 1972. 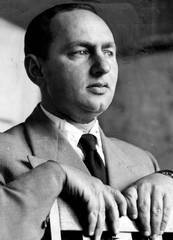 Evatt remained leader of the Labor Party until he left politics in 1960. The Petrovs became Australian citizens in 1956 and lived in suburban Melbourne. Petrov was given the name ‘Sven Allyson’. ASIO continued to interview the Petrovs for many years and the information they provided about methods of Soviet espionage was of great value to Western intelligence.